Your home is a haven, a culmination of your hard work and an investment in your future. As the place where you build your family, spend time together, experience special moments, host special occasions and kick off your shoes after a long day, it should be something you’re proud to call yours. Part of investing in and appreciating the home you own is enjoying its aesthetic and styling your interior to suit your personality and tastes. When it comes to your home design, picking the perfect flooring is essential to set the mood for each room, accent your décor and furniture, offset your furniture and provide long-lasting functionality and durability. That’s why so many home-owners choose laminate floors for the strength, longevity and aesthetic they love. With 50 Floor’s beautiful variety of laminate flooring in multiple materials, you’re sure to find the floor that fits your home and vision. Back Layer: Providing moisture resistance and structural stability, the back layer of the flooring includes melamine reinforcement to keep the base sturdy. Fiberboard Core: Providing both stability reinforcement and impact resistance with a solid coreboard center, the fiberboard core layer also includes an edge sealing treatment for further stability and durability in the structure. Decorative Layer: The signature layer in laminate flooring, the decorative layer provides the floor’s beauty and iconic appearance with the addition of an in-depth, detailed photo to make the flooring look like wood, tile, ceramic or another material. Wear Layer: As the top layer, the wear layer is composed of melamine and aluminum oxide, making a clear, tough finish that provides extreme resistance to wear, moisture, staining and fading. 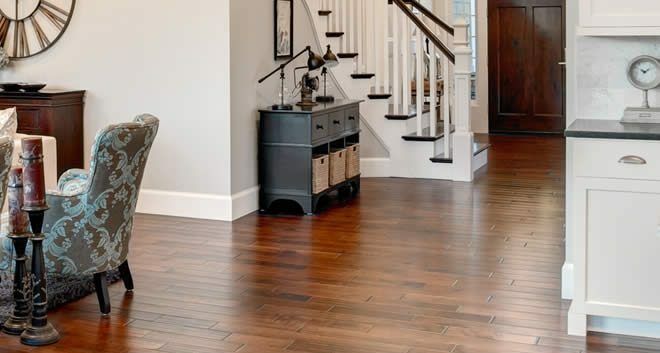 One of the best parts of laminate flooring is its ability to appear as attractive and authentic as many different types of real wood flooring without posing some of the wear-and-tear or maintenance issues – and at a fraction of the cost. Whatever style you choose, your laminate floor will provide incredible durability and stain-resistance, fit together seamlessly without leaving gaps between the pieces and offer you the ability to reassemble if necessary. When you’re looking for the best place to find laminate floors to fit your home, there’s no better source than 50 Floor. We offer a broad, stunning selection of choices with a unique, at-home shopping experience. We’ll help you decide on your ideal flooring by bringing our samples straight to your home and letting you consider them in the exact room where you plan to install them. When you’ve made your final choice, we’ll take care of your installation with expert care — all in one day. When it comes to choosing the flooring that fits your home best, 50 Floor has the variety, quality and expertise you need. Plus, we offer the comfort and convenience of shopping in your own home. Make an appointment for your free consultation today to get started revitalizing your home.